Click here for my Applause Clinic and Travel Schedule! The purpose of a freestyle clinic is to give riders the skills to create their own freestyles, or to better understand the process if they are having their freestyles designed by me. Because they do not focus on the technical aspect of training, freestyle clinics are fun for both riders and horses. The private mounted sessions are also interesting and educational for spectators, whether they are riders, coaches, judges or non-riding friends and family. While the rider will benefit from a single session, two sessions on consecutive days is recommended, in order for me to be able to cover the entire design process. In the initial session the rider first learns how to determine his or her horse's tempos. Once the horse's tempos at trot and canter have been measured, music is introduced. I bring to every clinic a large selection of music from many genres. Music for the trot and canter that matches the horse’s gaits is now played, and the rider learns to develop a feel for riding to a constant tempo and to different types of music. This is probably the most fun part of the clinic (riders have told me that it is like having a personal horse DJ), and will take up all of the first session. In the second session, the focus turns to choreography. I work together with the rider – and sometimes the rider’s coach – on designing a pattern that conforms to the technical requirements for that pair's level and best highlights the horse’s strengths. By the end of two sessions, the rider will have gone through the entire freestyle design process, minus the editing. I do occasionally give three day clinics, and they work quite well for riders at the FEI levels – it is usually difficult to design a pattern at that level in a single session. Seminars can be given either on their own or in conjunction with a clinic (clinic organizers: it is advisable to hold a seminar the evening or day before a clinic). In the three hour lecture I cover all the points that are important to understanding how freestyles are created and judged. Attendees will learn about every step of the design process, and what to consider when choosing music. They will watch videos of internationally and locally performed freestyles, and look at sample judges' score sheets. I go into considerable depth in explaining how freestyle tests are judged, and why there is often surprise at the score board. I welcome questions throughout the lecture, as well as at the end. 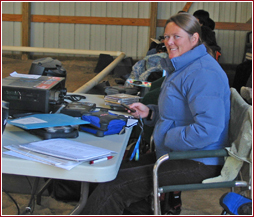 The depth and breadth of topics covered makes the lecture meaningful to anyone interested in dressage freestyles. If you have already held an Applause Dressage seminar in your area, I can give more specific and detailed follow up lectures that focus on an area of particular interest to the group. I never run out of interesting things to say about my favourite topic!